When my daughter was five years old she had a pet crab named Clyde. He was purple, two feet across, and invisible. "Mom," she said to me one day, "You don't believe that Clyde is real." "Of course Clyde is real!" I said. She stuck out her lip at me. I guess she had heard somewhere that parents never believe in imaginary friends. I tried not to laugh. "Clyde is a real imaginary crab!" "NO!" my daughter hopped up and down. "Clyde is a real REAL crab!" It wasn't hard for me to imagine Clyde scuttling around the house, barley avoiding my feet as I walked the baby or hauled laundry baskets. Every now and then I would tease my daughter, "I haven't seen Clyde around lately. Is he all right?" "Mom, you can't SEE Clyde. He's invisible!" He was real. As real as anything. A few years later I overheard my boys arguing. They had wands made from tightly rolled-up paper in their hands. One shouted to the other, "Well, Harry Potter isn't REAL anyways!" "Of course he's real," I said. "Harry Potter is a real fictional character, and he puts very real money into certain peoples' pockets." This year at Writing and Illustrating for Young Readers I learned that, biochemically, there's very little difference between reading about something and experiencing it. The reader enters a waking dream in which adrenaline, dopamine, serotonin, and other lovely chemicals are released into the bloodstream just as if things were really happening. The difference is, a reader can close the book and come up from the waking dream with limbs intact and life all around just as it was before. The consequences of reading a story are harder to see than the consequences of living an experience. But the consequences are there. The consequences are there inside. And what's inside begins to affect what's outside. I've read books that changed the way I looked at the world. Nothing afterward was ever quite the same. And in that way, fiction is very, very real. 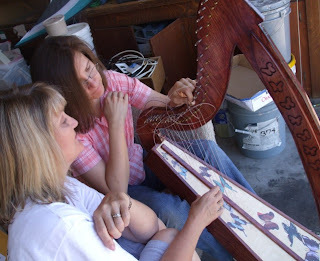 When my friend Kathy heard I was making a new batch of harps, she said, "I want to make one too!" She paid for the supplies, then came to my garage once or twice a week so we could work together. It sure helped to have another set of hands. I'll need to find a new harp-making partner when I get to Hawaii. Here we are, stringing it up. Kathy's daughter painted the butterflies on the soundboard. 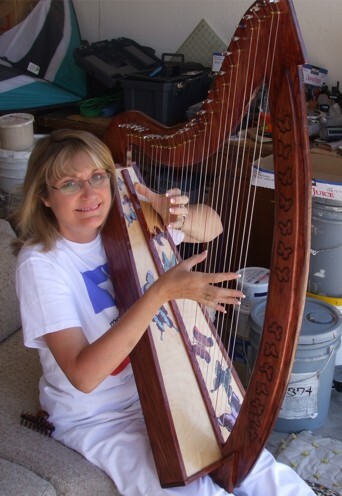 Congratulations to Kathy on a fine piece of woodworking! When Andy packs up for college, his toys think that being donated to Sunnyside Day Care will beat being stored in the attic, or even worse, being sent to the landfill. At first, Sunnyside seems the perfect retirement home for well-loved toys. And then things go horribly wrong. After the first two Toy Story movies, I thought the people at Pixar had exhausted the subject. What else was there to say? Ho ho! Was I ever wrong! This film has a fresh story that ties in well with the other two, and brings the series to a very touching, very satisfactory close. I laughed a lot and cried more than I expected to. With its slower pacing, smart jokes, and prison-break parody plot, this film targets older kids and their parents more than the little ones. My four-year-old, who was riveted by "How to Train Your Dragon," wouldn't sit still for "Toy Story 3." He still says he wants to go see it again, though. Maybe I'll take him tomorrow. Anyone seen "Dead Poets Society?" Do you remember that poetry lesson where they tear a page out of the textbook? That was my high school's AP English textbook. Besides having an unenlightened view of poetry, the book preached that there were two types of fiction: escapist commercial fluff on the one hand, and serious valuable literature on the other. Commercial fiction and literature were mutually exclusive. Like broccoli and chocolate sauce, they don't go together. It was as if there was a Conservation of Awesomeness, so that the more fun a book was, the less it could have something valuable to say. That textbook sent me on a life-long quest to find books that were not only fun to read, but were well-written and honest about the human experience. It sent me on a quest to write such books myself. As I got deeper in to the craft of writing I learned how difficult it could be. Why not lie to the reader, pull a few gimmicks, and then cheerfully collect their money? Definitely the easier road. But the great classics, the books with true staying power, are those that defy the law of Conservation of Awesomeness. This past week I went to a writer's workshop. My teacher, who has published dozens of books and worked in the film industry for many years, taught us what goes into creating a delicious read. Books don't become bestsellers by accident. There's a science to it, a method that can be learned. And that method is, as I suspected, mostly independent of the soul of the book. I could write a thrilling roller-coaster ride of a book that doesn't have anything valuable to say, or I could write a thrilling roller-coaster ride of a book that shares something important I've learned about life. Sure, the entertainment industry is full of pirates and gangsters that only care about separating people from their money, but there are a few who really care about what they're saying, who know that communication in all its forms can change the world for the better. Words give us the power to share experience. The more satisfying and fun to read my book is, the more people will want to read it, and the more readers will share what's inside of me that's aching to be said. And that would be truly awesome. Mix water and sourdough start, sprinkle with yeast and let stand for five minutes. Add salt, olive oil, and enough flour to make a soft dough. Knead for 10 minutes, then let it rise until double. While the dough is rising, go start the coals for the dutch ovens. When the dough is doubled, punch it down and divide it into eight pieces. Tear off a square of aluminum foil and tuck it into the bottom of the dutch oven to shape it, then pull it out and grease it lightly. Roll one piece of dough out on the foil until it forms a 12 inch circle. Repeat with remaining balls of dough. Make pizza sauce. Here's my recipe: 2 cans tomato paste, equal amount of water, 1 tsp Italian seasoning, 1/2 tsp salt. Spread sauce on the pizzas, then add cheese and any other toppings. The fun part about doing small pizzas is that everyone gets to "decorate" their own. By now your coals should be ready. 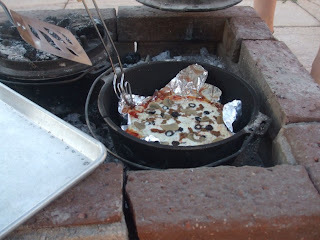 Preheat the dutch oven with enough coals to heat it to 450 degrees F. Using the corners of the foil square, lower one pizza into the dutch oven. Bake for five minutes with top and bottom heat, then remove the oven from the bottom heat and cook for another 5 -10 minutes with top heat only. When the crust is lightly browned and the cheese is bubbly, use the tongs and spatula to remove the foil and pizza from the dutch oven. Repeat with remaining pizzas. This recipe makes 8 small pizzas. We had two dutch ovens so I could bake them all in under an hour. My clever plan was to make pizza without heating up the house. BUT I had to work outside with an OPEN FIRE in 110 degree weather. So I would have been a lot cooler if I'd stayed inside and turned on the oven. Oh well. At least I've got a new trick for the next time we go camping! I loved spending a week at the Writing and Illustrating for Young Reader's Workshop! Friends from two years ago were happy to see me. I could start a conversation with anyone by saying, "So what do you like to write?" Classmates would stop me in the halls to tell me how much they liked my work. Every day I was having my mind blown away by new ideas on how to become a better writer. What could be better? One of my children met me at the door and gave me a hug, but the others were busy playing upstairs. After I'd crashed on the couch for a while and checked my e-mail, they still hadn't come down. Didn't they know I was here? Their soon-to-be-famous-author mother? I found my four-year-old and said, "Eian! Give me a hug!" He put on a suspicious frown. "Where are you going?" "Nowhere. I just came back." "Oh." He smiled and threw his arms around my neck, then ran off again. Did he even notice that I'd been gone? As the afternoon wore on, I got more attention from my children. "Mom, I'm bored!" "Mom, can I have a drink of water?" "Mom, Daniel's not being fair!" Not quite the kind of attention I had been getting from my writing friends. My ego sprang a slow, hissing leak. Around here, I was just plain Mom. Deflated, I dragged myself back into the routine: wash dishes, move laundry, what's for dinner, no hitting, get your feet off the furniture. But I liked it. Here at home, I'm comfortable. Here at home, there's nothing to prove. By this morning my head had returned to its normal size. When my eight-year-old crawled in bed with me, snuggled up, and shared all the wild adventures he'd had in his dreams last night, I couldn't imagine a better place to be. The first time I went to the Writing and Illustrating for Young Readers Workshop, I had been working on the same book, off and on, for over a decade. I'd written a few short stories (one of which got published--YAY!!!) and had another novel I would peck at occasionally, but that one book had been my main focus. On the second day of that workshop, I found out that my one book, my one shining star, my baby, was utterly unpublishable. The characters were supposed to be college students, but everyone in my critique group said they talked and acted like middle-school kids. The premise and the light, funny contemporary fantasy setting were both middle-grade too. I had started out with an entire chapter of "maid and butler" dialog, in which the characters were informing the reader instead of really talking to each other, and there was so much backstory that my teacher, Brandon Sanderson, said, "Where's chapter zero?" Maybe had I started the story in the wrong place. Maybe I should be writing middle-grade instead of YA. That was going to take an OVERWHELMING amount of work. So I went home and gently put that unpublishable manuscript in a box in the garage. I wrote another book, went back to the workshop a second year, wrote a third book, began a fourth one, but all that time my first book kept calling to me. The characters would not let me go. The premise kept coming back to my mind. Nearly two years after my initial disappointment, it was time to try again. I made the characters younger and thought up a new storyline, wrote two chapters, and took them to David Farland's class at this year's WIFYR workshop. Was it good enough now? I couldn't say. I was hoping Dave would tell me. He gave the project a thumbs-up. A big thumbs-up. Coming from Dave, who has trained a whole long list of bestselling authors, that meant a lot. No, I haven't been posting lately. 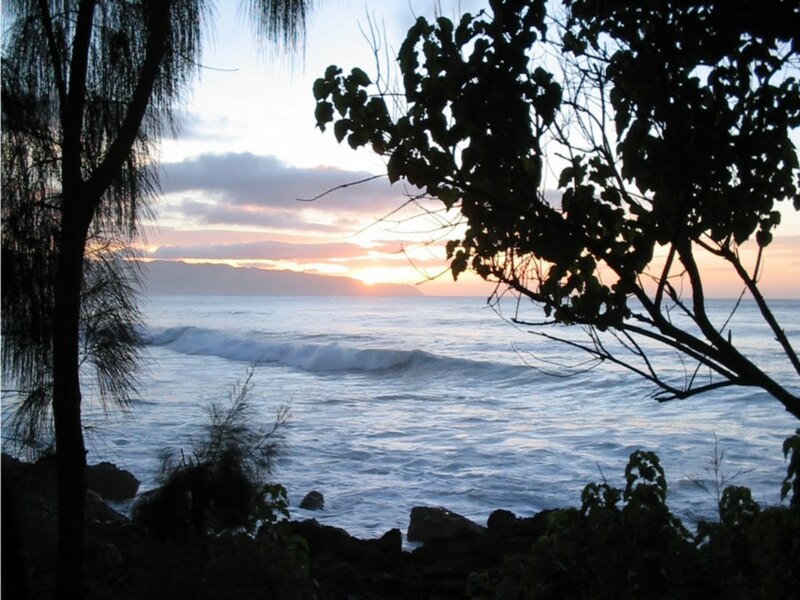 That's because I'm moving to Hawaii in five weeks. But that's not all. Next week I'm going to the Writing and Illustrating for Young Reader's Workshop. Then the week after that my husband is taking our oldest son to Scout Camp. And then we're going to LA for a few days to say goodbye to family before we move to the far side of the moon. And then my two middle sons are going to Georgia to spend two weeks with other family. And THEN I finally get to move to Hawaii. So I'll see you after we get internet set up in our new place. Love and happy thoughts!